Our facility is located on site in Hackettstown, NJ. 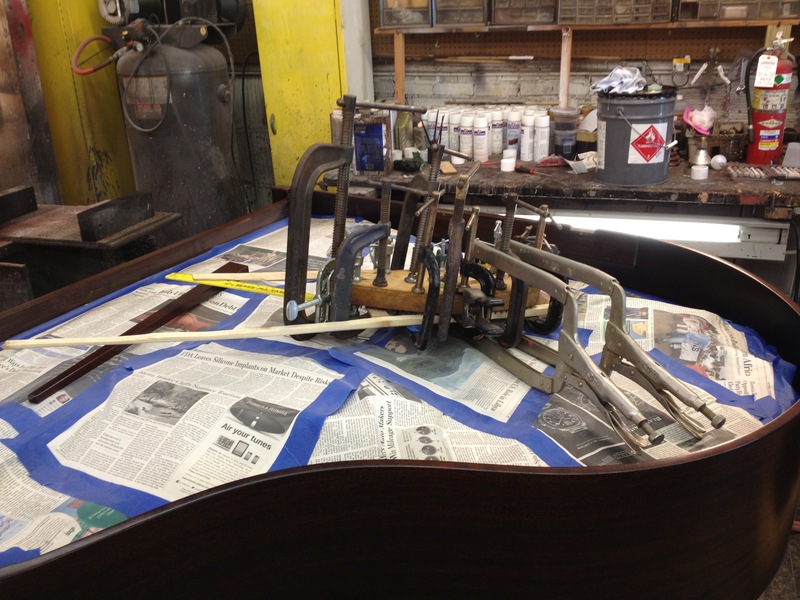 Every piano we refinish, rebuild, or recondition is a reflection of our commitment to quality. Fine piano restoration, like fine piano building, is 1000 things in a row, done right. It is detail oriented, often tedious, but the satisfaction received from it makes it worthwhile. Our shop team is an inspired and inspiring group of people. The apprentices, refinishers, rebuilders and tuners all have their special roles to play in the restoration process. Customers often visit our shop to participate in selecting a stain color for their piano or just to see firsthand what we do. The piano is stripped down to bare wood. It is sanded, stained, sealed and topcoated with six coats of either satin or gloss lacquer. The important thing to remember about this finish is that pores of the wood show. The piano is stripped down to bare wood. It is then sanded, pore filled, stained, sealed and topcoated with twelve coats of gloss lacquer. The finish is then sanded with 1000 grit sandpaper. It is then rubbed, first with course, then medium, then fine compound. The important thing to remember about this finish is that the pores of the wood do not show. The finish has a look of depth. It is a much richer look than an open pore finish and is approximately double the cost of an open pore finish. The same procedure as a high gloss finish is used, however, the final compounding steps are replaced with a two step process of rubbing with steel wool and burnishing with a cotton pad. The cost of this finish is approximately two thirds the cost of high gloss. In this process, we refinish over the existing finish. We first clean and fine sand all the surfaces. Next, we fill in major dents and touch up the scratches. We then seal in our touch ups with a tinted lacquer. Over this tinted lacquer we apply our final topcoats of clear lacquer. Finally, we rub out the entire surface with steel wool and burnish with a cotton pad. The important thing to remember about this finish is that the final look is not one of perfection. With some pianos, a major improvement is seen and with others only a minor improvement is seen. We always discuss this job in detail with the customer while we are looking at the piano. Depending on the customers expectations and the condition of the existing finish, we will make appropriate recommendations. The piano soundboard is the large, solid plank of wood (usually spruce in quality instruments) that is used to enhance its resonance and tone. The soundboard is found below the strings in a grand piano (or any horizontal keyboard instrument), and behind them in an upright. The soundboard is replaced with a new one. A new pinblock is installed, new strings are installed, and new dampers felts are installed. The original soundboard is dried, cracks are shimmed, board is refinished, new pinblock is installed, and new damper felts are installed. Action options are quite varied and a visual inspection is usually needed in order to make the appropriate recomendations. Pricing is for grand pianos. Please call 908-482-1628 to discuss upright pricing. Fill out the form below to get a piano restoration quote.